Back in 1872, our nation had a really great idea – some have called it “America’s best idea” – to establish an area called Yellowstone as “a public park…for the benefit and enjoyment of the people.” Yellowstone National Park was the first of it’s kind in the entire world, and now exists as one of 59 National Parks in our country and one of 1,200 national parks and preserves worldwide. The National Parks wouldn’t exist today without the tireless efforts of two conservation champions: John Muir and Theodore (Teddy) Roosevelt, 26th President of the United States. John was a wild woodland wanderer, whose prolific writings about the emotional and spiritual value of preserved wilderness inspired Teddy, an equally passionate outdoorsman, to devote his presidential influence to protecting places of natural beauty and historic significance. Our 2016 maze design is an unique homage to the iconic National Park posters that were produced by the WPA Federal Arts Project between 1938 and 1941. From left to right: Yellowstone National Park Poster of Old Faithful Geyser, produced by the WPA Federal Arts Project between 1938 and 1941 (Image courtesy of the Library of Congress); Our homage to the original poster, featuring Teddy Roosevelt and John Muir © Mike’s Maze 2016. All Rights Reserved. ; Our 2016 maze “See America” © Mike’s Maze 2016. All Rights Reserved. A stunning depiction of Yellowstone’s Old Faithful geyser surges up in our 8-acre corn field, with Teddy Roosevelt’s striking profile emerging from the misty cloud. John Muir, “Grandfather of the National Parks” observes the sublime scene from below, silhouetted against his beloved pines. 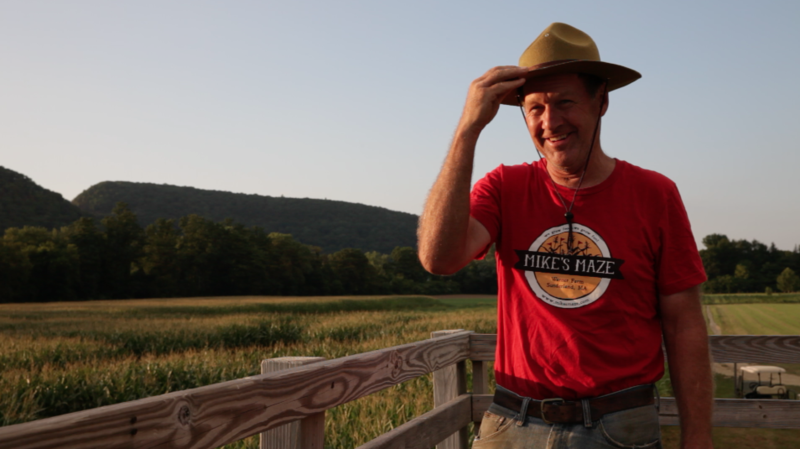 Tourists visiting Mike’s Maze will be delighted to find the farm transformed into a “National Park” complete with its own geyser, “Ol’ Reliable!”. Kids of all ages will enjoy wandering the maze on a search for wondrously life-size “wildlife” specimens while aspiring “Corn Field Naturalists” can challenge their intellect with our Ranger-In-Training game. During their visit, tourists can drop a coin in our Tower Viewer to get magnificent views of nearby Mt. Sugarloaf! All profits collected from the viewer will be donated to the National Parks Conservation Association. 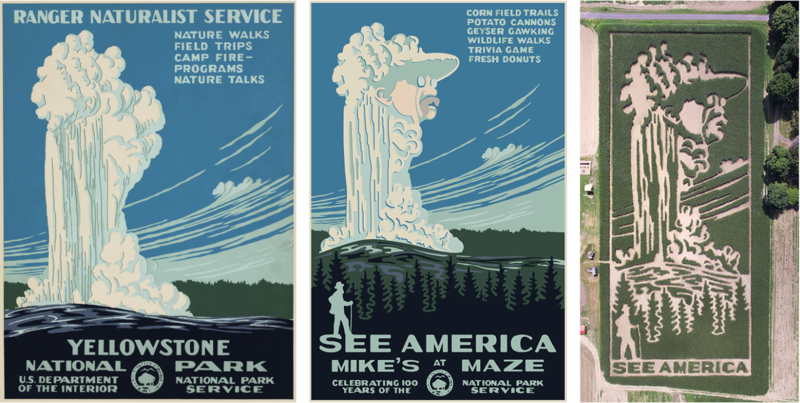 Mike’s Maze would like to thank “Ranger Doug” Leen for his outstanding work rescuing, reproducing, and repopularizing the imperiled WPA National Park posters that inspired our maze design this year!